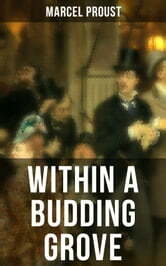 "Within a Budding Grove" beautifully examines the complex adolescent relationships that the unnamed young narrator begins to witness all around him, including the first pangs of love and the ardent adolescent desires. But most importantly it explores the unbridgeable gap between childhood innocence and the disappointment of adulthood. The novel was scheduled to be published in 1914 but was delayed by the onset of World War I. When published, the novel was awarded the Prix Goncourt in 1919. "My mother, when it was a question of our having M. de Norpois to dinner for the first time, having expressed her regret that Professor Cottard was away from home, and that she herself had quite ceased to see anything of Swann, since either of these might have helped to entertain the old Ambassador . . ." Marcel Proust (1871–1922) was a French novelist, critic, and essayist best known for his monumental novel À la Recherche du Temps Perdu (1913-1927). He is considered by English critics and writers to be one of the most influential authors of the 20th century. Charles Kenneth Scott Moncrieff (1889–1930) was a Scottish writer, most famous for his English translation of most of Proust's À la recherche du temps perdu, which he published under the Shakespearean title Remembrance of Things Past.